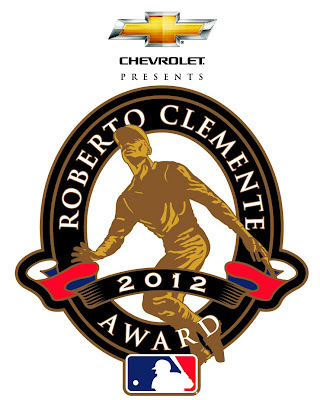 Major League Baseball and Chevrolet, the official vehicle of Major League Baseball, today announced that Clayton Kershaw was named the Dodgers' 2012 nominee for the prestigious Roberto Clemente Award presented by Chevrolet. 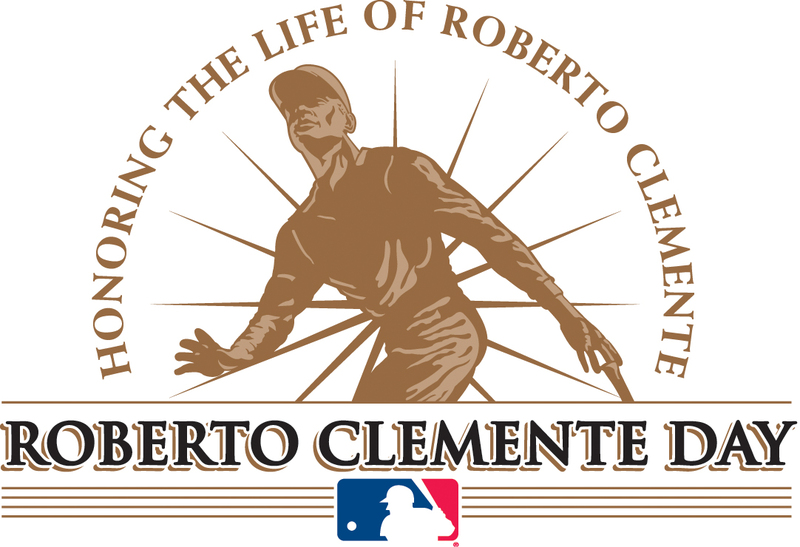 Today marks the eleventh annual Roberto Clemente Day, which was established by Major League Baseball to honor Clemente's legacy and to officially recognize local Club nominees of the Roberto Clemente Award presented by Chevrolet. Kershaw is one of the 30 Club finalists for the annual award, which recognizes a Major League Baseball player who best represents the game of baseball through positive contributions on and off the field, including sportsmanship and community involvement. The Roberto Clemente Award presented by Chevrolet pays tribute to Clemente's achievements and character by recognizing current players who truly understand the value of helping others. 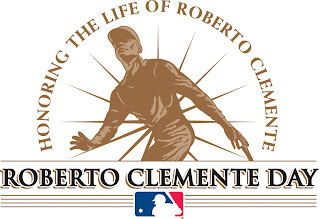 The Award is named for the 15-time MLB All-Star and Hall of Famer who died in a plane crash on New Year's Eve 1972 while attempting to deliver supplies to earthquake victims in Nicaragua. Go here for a link to the awards website. As you know Clayton and his wife Ellen started Kershaw's Challenge- a foundation which believes in the transformation of at-risk children and communities through the benevolence and impact of others. He has donated $100 for every strike out, co-wrote a book with Ellen called Arise: Live Out your Faith and Dreams on Whatever Field You Find Yourself, helped build an orphanage for children in Lusaka, Zambia, and hosted Clayton’s Texas BBQ and Hoedown. I am sure the recognition of his efforts is appreciated, but probably unnecessary. He and his wife strike me as the kind of couple who do this because they are driven to. 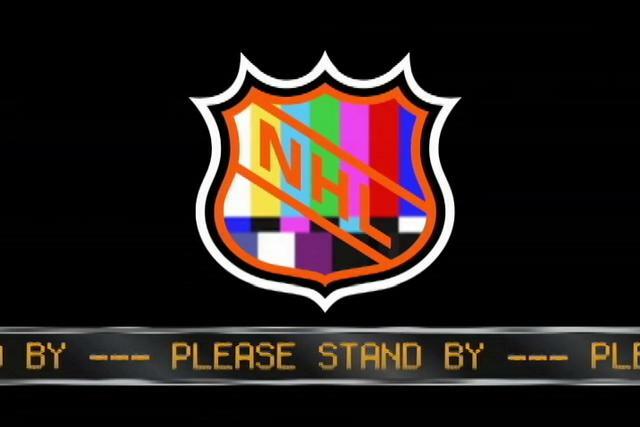 Nevertheless, good luck. I can't think of a more worthy candidate. I just received an email from a friend of mine. Something unthinkable has happened. Someone has TAKEN his Vinny bobblehead. 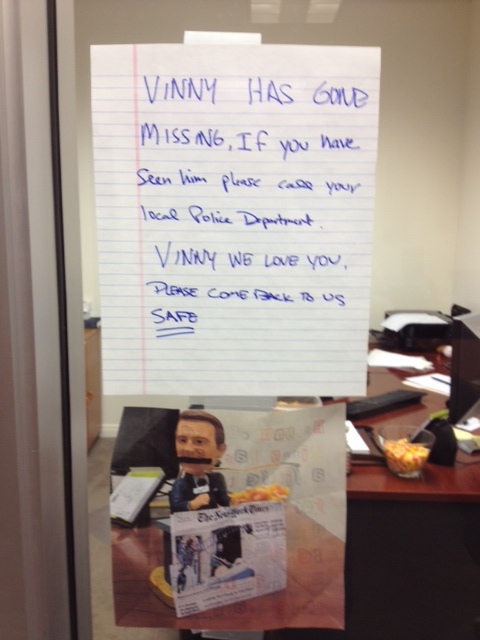 Check out what the culprits put up in his office. In a fit of rage he responded. Check it out below. I know it's tough to read, so below are the words he had for the kidnappers. I don't know who you are. I don't know what you want. If you are looking for ransom, I can tell you I don't have money. But what I do have are a very particular set of skills; skills I have acquired over a very long career. Skills that make me a nightmare for people like you. If you let Vinny go now, that'll be the end of it. I will not look for you, I will not pursue you. But if you don't, I will look for you, I will find you, and I will kill you. Just another awesome day in the office, eh? Sam Miller at Baseball Prospectus unearthed some of the writings of Vin Scully from the LA Times in 1958. Her name was Sister Virginia Maria and she sat behind a large, scuffed desk in an eighth-grade classroom that smelled of ink and chalk dust. She carried a tiny tin pail of water and a little sponge for cleaning the blackboard and it was badge of her profession as much as her long black habit and string of beads. She was a member of that wonderful group of women known as the Sisters of Charity. She smiled with blue eyes behind a pair of thick spectacles and she frowned with a yardstick across the back of your knuckles. She was a teacher, mother, nurse and confidante to a group of 50 children in a small parish in New York and, above all, she was my friend. She helped me become a sports announcer. Be sure to check out BP story. They share a bunch of different things to check out. Both the Sons of Steve Garvey and Vin Scully is My Homeboy review the new Cool-A-Coo Ice Cream sandwiches at Dodger Stadium. nom, nom, nom!! Nomo's Sushi Platter get some former Dodgers to sign through the mail. I'm happy to hear that Don Mattingly will be returned next season, via Dylan Hernandez of the LA Times. Manny Ramirez finds God at a MegaChurch, via Busted Coverage. How about Luis Cruz, eh? Steve Dilbeck at the LA Times writes about him being this seasons feel-good story. The Sons of Steve Garvey puts up some Dodgers rookie hazing pics.